Quite unlike our January 1st New Year’s Day, we in the Church have a less festive way of celebrating our turn of the calendar year, for this is a new year. If you’re keeping track of readings, we’re in Year B now, a year we’ll get to read lots from Mark, and for the Daily Office, we’re starting Year Two. But I doubt many of you stayed up until midnight to mark the occasion–no fireworks, singing, or festive parties. Then you come to church (you faithful lot), and solemnly light one candle and proclaim to you to KEEP AWAKE since second coming may be nigh. What does it all mean? We say “keep awake” as we enter the darkest time of the year. The last thing I do to keep awake is to turn out all the lights and let things get quiet; that’s actually the perfect setting for really good sleep. We do need good sleep. We’re tired and weary from all our worries and concerns and trying to get everything done. We need rest. We need our basics to be taken care of. So “take care of you” is what I often say. I might have borrowed it from Pretty Woman, but the words get at the oft-forgotten need to truly care for ourselves. When we are rested up, taken care of, safe, and prayed up, there’s something about entering into darkness, letting things be shadowed. We’re aware and alert, appreciative for the intensity of the darkness, grateful for our safety in the unknown, and incredibly sensitive to the liminality of space and time when we just don’t know what might happen next. Liminal times seem to sneak up on us but are pretty predictable. We find them in our traditions. They have a way of taking us out of chronos, out of chronological, sequential time, and putting us into that no-time and all-time, the moments of kairos time. I was fortunate to be able to attend my friend’s funeral this past week. It was an unexpected death, though we all know we will one day die. Hugging his mother outside the church on the beautiful sunny day, she said, “Good morning,” though it was afternoon, and then laughed through grieving eyes as she said she really didn’t know what time it was. I held her arms and smiled, knowing that in birth and death and all times marked by deep love, these are particular times when the separation between heaven and earth and all dimensions seems so very thin–that if we just closed our eyes, we could reach into the unknown. As we listened to the Word, the music, and the homily, our hearts open and vulnerable, the distance between us and our beloved was not far, and the connection between each of us gathered was nearly palpable. After the funeral, on the way back home, I opted for the road less traveled. But you know how when you gotta go, you gotta go? That was me. Let me tell you, there aren’t many amenities to choose from in the Ouachita Mountains between Hot Springs and Russellville, but there is a campground at Hollis. If I had listened to my body the first time, I could have stopped at the nice visitor’s center, but I didn’t (that’s another lesson: listen to our bodies!). At the Hollis stop, there was what looked like little yellow Post-It notes on the bathroom doors. I thought it was weird but maybe a new thing to leave notes for folks. (You never know what the new trend is!) Bringing my keys and phone with me, I realized that it wasn’t notes but yellow duct tape over bullet holes that went through the door; the ones that didn’t go through just dented the door and removed the paint. Glad I brought my phone with me (because this is obviously how scary movies get made), I also realized there is no light inside this old-school forestry cinderblock outhouse. When I got out and stepped back into the fresh air, I was caught in a pause. Maybe it was the fresh air tinged with smoke from the forest fires; maybe it was the twilight. Maybe it was the stillness . . . the stillness of being in the woods when I stop walking along making all manner of noise because it feels like I’m the one disturbing the sacred silence for the lives of those all around me. It’s a feeling of being watched, knowing I’m not alone but also of being unafraid. It’s still. I’m keenly aware, with heightened senses, actually. Looking around expectantly but also waiting patiently because I know I don’t know, but I might just feel the presence of Spirit in my goosebumps or in the swell of my heart or a deep sigh or in an even deeper knowing, though I can’t quite put my finger on it or words to it. It’s a connection to a deep mystery in a brief moment. I pondered this concept of alertness in stillness and silence and found myself taking a seat at Crystal Bridges in one of my favorite sections of art. Having just been outside, I knew that darkness had settled all around. 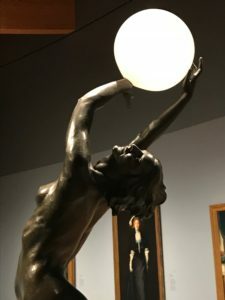 The lighting in the museum is soft, almost hushed, intentionally angled to highlight pieces, to invite illumination and shadow. We need the light and the dark to see the relief, the detail in the sculptures, the shadows in the painted compositions. It’s amazing and to me conveys the energy the pieces bear. The pieces themselves are alert and vivid but perfectly still . . . silent . . . waiting for the next person to round the corner and engage and notice so that the hidden meanings, the random strokes, every shade and hue can reveal itself to the reaction of another–be it fascination, disgust, or ambivalence. We need light to see, but we don’t need light to feel. We only need relationship, consent to engage one another that we might reveal to the world our beauty of creation, including our shadows, which are part of our beauty. We’re just waiting for the light to come and fully illumine us, that we might be restored in full relationship with God, one another, and ourselves. We yearn to be restored to the fullness of this Holy Presence. We think we have to go someplace, do something special, say magic words, but as we say in our Psalm (and will say in our prayers Sunday morning), we need only the light of God’s countenance to be saved . . . from ourselves, from resignation, from the sin of turning away from God, losing ourselves in darkness void of Light. How God’s countenance is shown to us–where it manifests–will be many and varied and in moments and places we might otherwise miss, if we’re not anticipating the Presence to be there. The only thing we have to do is consistently be. Maintain wakefulness. Stay alert. Be aware. So that when we encounter those holy moments, we don’t miss them. Let our lights be dim at home this season. Turn off the notifications on our phones. Make space in our calendars to sit in silence or at least to seek stillness. (There are apps to help — Headspace and Calm are a couple.) Listen to the 1A podcast about silence from Thursday morning. Be alert enough to notice what surrounds us. When we start to feel like we’re drowning in our own chaos, let’s not miss the Presence calling us into wholeness, casting out a cord of light, of hope so we don’t lose our way. This Advent season is about God restoring us through Christ, but we have to be open and alert to hear the message. It helps to slow down and get quiet to hear that still small voice. It’s okay to sit in the darkness, light a single candle, and wait in anticipation for the light to shine in expected and especially in unexpected ways. It’s what we’ve been waiting for, in this moment and the next. We’ve just been trying to get the timing and the light just right to illuminate what’s there all along: God, the presence of Christ, the power of the Holy Spirit.